Please proceed to register for the Sept, Oct or 2016 Research Trials. ASPIRE55 is offering free strength training workout sessions for 10 weeks for members who are keen to be part of the research trial on exercise for active older adults. 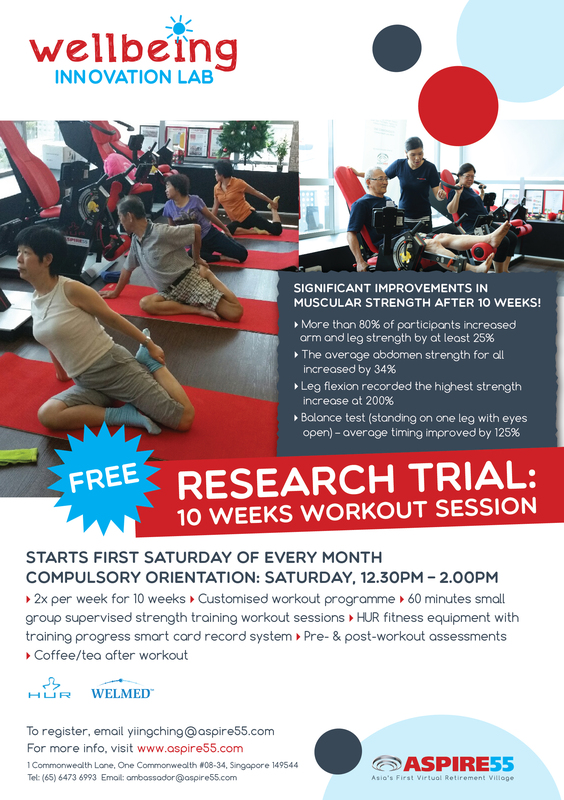 This research trial will start from 1 August to 10 October 2015 (10 weeks) and participants are required to commit to attending workout sessions twice a week for 10 weeks. Registered participants are required to attend a compulsory Orientation on 18 July 2015, 2 - 4 pm at ASPIRE55 Wellbeing Innovation Lab, One Commonwealth. The registration is only open to members who did not sign up earlier to be part of the earlier batches of the Research Trial.